The church belongs to the parish of St Mary Southgate. Its foundation stone was laid in 1968 and it is incorporated in a primary school of dark coloured brick. Externally, only a cross shows it is a church. 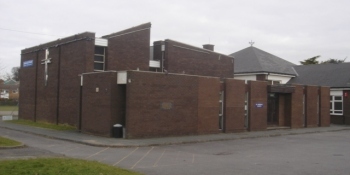 In 2010 it was remodelled to include facilities for the social side of the parish’s activities, including a cafe (CT 22 October 2010). Banners: Painted on canvas with abstract designs including lettering by P Meynell (ibid).